Farmhouse in Chianti consists of 3 apartments with pool in typical Tuscan style. Each apartment has a large fireplace, where once the farming families would gather for conversation and spent much of the winter evenings. The whole house retains the charm of the Tuscan farmhouse with original furnishings and floors and a large terrace overlooking the hills of Chianti to spend summer nights sipping fine wine. What makes this farm is the familiarity with which the hosts Alberto and Brunella will welcome you, and we will take care during your stay with sunshine and directness typical of Tuscany. You can taste the wine, sweet wine and the oil produced in the company following the family tradition. 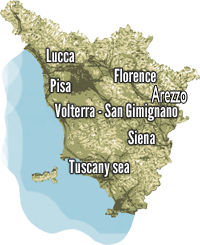 The location is strategic due to its proximity to Florence, San Gimignano and Siena, reachable by public transport about 2 km from the farm. The total price includes: Use of the pool (5mx10m opening mid April – mid September), linen and towels, utilities, tennis court, initial cleaning, weekly change of linen, cot or bed, BBQ, laundry. City tax to pay on site: €1,50/adults (childs over 14 years old free) per night for first 7 nights.